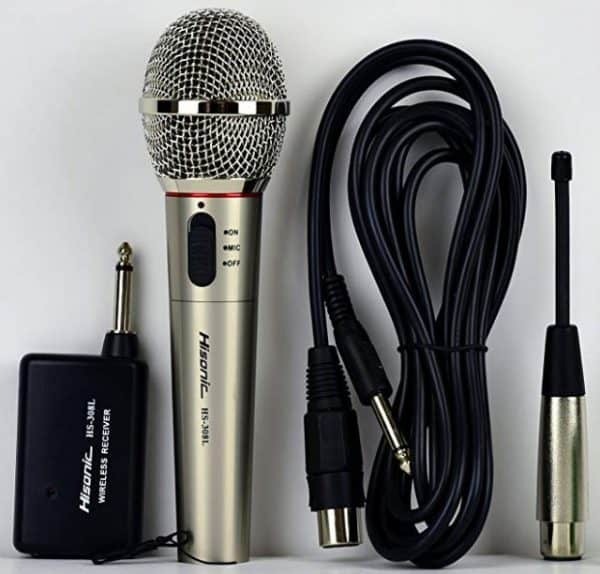 Amazing Microphone, you can use it in two ways: Wired or Wireless, it is fun to use it, no matter you plug direct to your singing machine or Karaoke amplifier, it is a perfect mic for party in holidays. The 6 feet long wire is good for a Karaoke party and you may use it by turning it to a wireless microphone. On the Receiver, you need one AA battery to power it, and just plug the 1/4″ plug to your MIC jack on the PA system. On the transmitter (Handheld Mic) , you need one AA battery to power it , there is a Mute switch on the mic to avoid noise or Bang on the mic when you turn it on while the receiver is on. It is simple to use and simple to set it up. No other parts needed,just plug and play !